This is the second post of the series 'Design Basics'. This series is based on Robin Williams' book 'The Non-Designer's Design Book'. Read the first post here. This is the first principle of good design. Proximity means closeness. Physical closeness of elements on the slide. What is the Proximity Principle? On a slide, there are many elements (images, text). The elements which are related should be placed together (physically closer) on the slide. The elements which are not related should never be placed together. Physical closeness (proximity) implies a relationship. Look at the example below. This is something very similar to what Robin shares in her book. 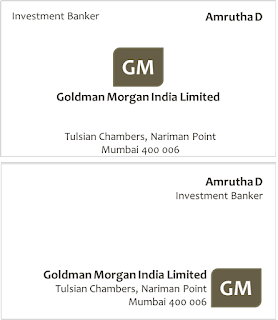 Which visiting card looks better? The one at the bottom looks better. There were 4 elements on the top visiting card. The proximity principle wants us to group the similar elements together. So we put investment banker with the name. We put the logo with the company name and address. Thus we make the card more organised, easy to understand and more appealing. What are the benefits of following this principle?1. The slides become more organised. Grouping similar things make logical sense. It also reduces the number of elements on the page, thus the total 'space' is managed better, visually. 2. This organisation tells readers where to start reading, how to navigate through the page and where to end. 3. All of this enhances the communication. The slide becomes easy to understand. 4. 'White space' is needed to rest the eye. By grouping similar elements, we are freeing more white space. We will discuss and understand more on 'white space' in a later post in this series. Let us take a look at this slide from Marico's presentation taken from their website. Marico is a leading FMCG player in India with market leadership position in hair oils. This slide relates to that. This particular slide does not look very good. The space on the slide is ill-managed. The elements are all haphazard. Let us try to apply what we learnt in this principle. Place similar things together. Do not place dissimilar things together. The slide talks about two things: Volume market share & Market size. The images, in this case, are only illustrative of the brands they are talking about. PCNO is the blue bottle, Nihar is the green bottle. I have marked 1 for elements which relate to market share, 2 for market size and 3 for images. This slide looks much better. The white space has been better managed. It can be improved further by applying the other three principles of design, but we shall not do that now. Through this example, we have learned how we can apply the 'Proximity Principle' to a slide and improve it. Tomorrow if we are touching up our slides we know how we will use this principle and make a small but important impact on the look and feel of the slide. In the next post of this series, we will learn about Alignment.